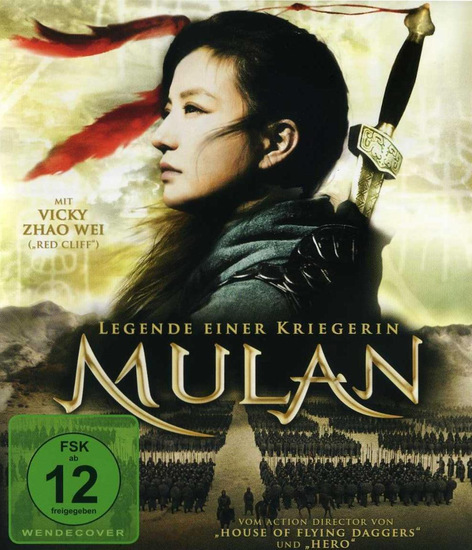 Mention Mulan and many will think of the Walt Disney animated movie from 1998, of course that story was taken from the many legends of Hua Mulan ,a hero of the ancient China . In the Walt Disney film the setting is the Han Dynasty and Mulan fights against the Hun , but the historical setting for her exploits are vague with the earliest recorded accounts being the Wei Dynasty where the Chinese fight the Rouran warriors.. In this film by Jingle Ma it is the Wei Dynasty which is the setting for our story. Of note there have been quite few films based on Hua Mulan ,the first in 1927. Now the story of Mulan is much the same through out the various adaptations of the story ,When the Wei Dynasty is attacked by Rouran forces the Emperor decrees all Military families send there men for battle to protect and defend there home. Farmers are allowed to stay and farm providing they supply food for the army. Also in this time woman are not allowed to partake in Military affairs ,in fact get caught with a woman in camp and your be executed. Now Hua Mulan has grown up with a love for martial arts, having lost her mother whilst young she has had to be tough . 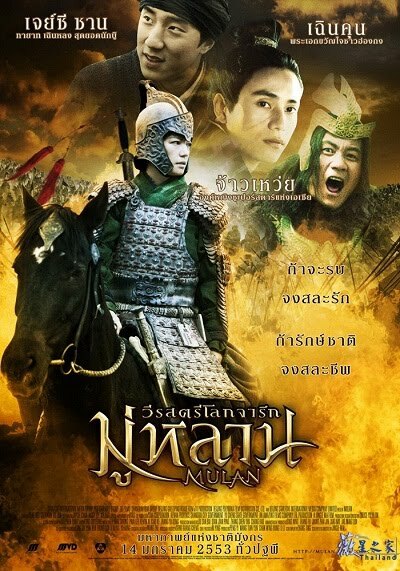 But when her ageing father is instructed to enrol for battle ,but Mulan is afraid for her father as he is ill .
That night she takes her father armour and sword and heads of to enrol disguised as a man to fight in her fathers place. 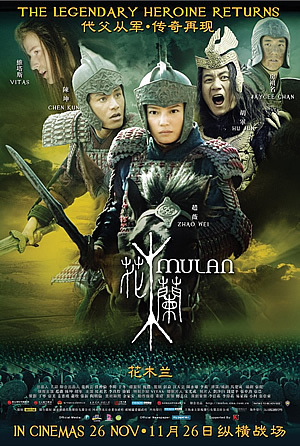 Now Jingle Ma's film is quite epic and the battle sequences are really well done ,giving a sense of despair and fear as young soldiers fight for their lives to protect their lands from barbaric invaders. In the role of Mulan is Vicki Zhao Wei ,now I was looking at Vicki Zhao and I was thinking ,i know her what have I seen her in . Yes then it dawned on me ! Shoalin Soccer , now this is such a different role for her and one she carries of so well that to be honest I was hooked within minutes of putting on the film ,also the fact that she is quite beautiful to look at . But this is also the funny thing about the film , the fact that any of these young conscripts can even think that she is a man is ludicrous ,she doesn't even attempt to cover her identity that well,speaking in her feminine voice. The Original Mulan must have been very clever at disguise or very butch to pass as a soldier in the Wei army. One thing for sure the film will have some laughs as Mulan tries to show her toughness ,it's great when a fight breaks out amongst the conscripts and she steps in to break it up ,her martial prowess showing through even though she is of very slight build. So Mulan tries hard and as she is a girl she tries harder then most ,it's also that she does not get found out and bring shame on to her family . Now upon enlisting Mulan gets found out by one of her child hood friends and fellow Villager who is up for Enlisting , the young Fei Xiaohu played by Jackie Chan ,no no got it wrong it's his son Jaycee Chan ( hell he looks so much like him,and I was so pleased to see him here to) , the character of Fei brings some much needed tomfoolery to the proceedings whilst at the same supplying a catalyst for Mulan's passion for victory and honour. But even before Mulan has made any head ground she is taken as a thief and held for execution ,it's only because of a Rouran attack that she escapes with her life with the help of fellow soldier Wentai , who also now knows Mulan is a female. With the attacks happening Mulan pulls together and her and Wentai help hold of the attacking forces, proving herself or himself if you please a worthwhile warrior and patriot Mulan and Wentai get promoted with each and every battle they win. Taking the title of General Mulan has become respected by her men and the government officials . 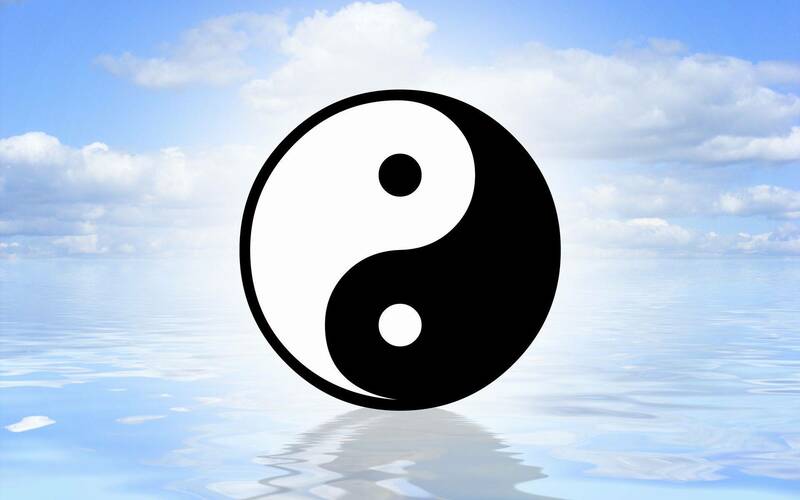 But one thing will let her down when most important , her femininity and secret love for Wentai. When a battle arises and Wentai gets cornered , Mulan leaves the supply convoy she is guarding to help ,but when she returns to find out it was a ambush and many of her men have been slaughtered she falls into despair and afraid to carry on . Staying behind In camp on one battle sees her have to come to terms with the one thing she was afraid of , losing Wentai. 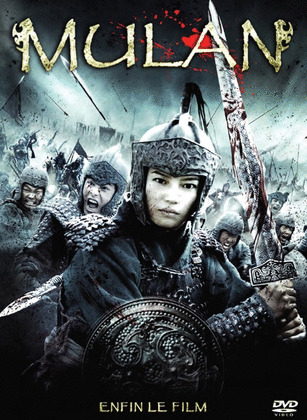 For me Mulan is a fine film ,it wont convert many to watching Asian cinema as I think you have to be into Asian cinema to fully enjoy and uncover the nuances of the feature. Unlike a film like Hero or Red Cliff which has more impact overall. Mulan fought in wars for 12 years and becoming one of the most respected Generals in Chinese History, what's more she retired and returned home to her aging father instead of taking up a government position which was offered to her. Even though by this time they new she was a girl. Jingle Ma's film is a great piece of escapism whilst giving a insight into one of China's great warriors . 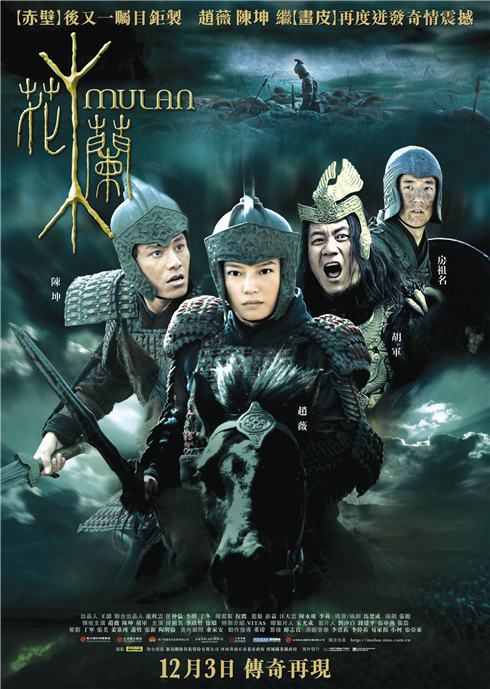 Vicki Zhao amazes through out offering raw power in her battle scenes whilst maintaining a emotional connection with her fellow soldiers in battle. And it's this reason by Jingle Ma chose her for the role over the likes of Zhang Zi Yi and Michelle Yeoh. Jaycee Chan is stupendous as Fei ,Mulan's friend ,he brings a good few smiles to the proceedings whilst giving a good performance. One person I did not recognise was Yu Rongguang as Hua Hu ,Mulan's father. He's one actor who is so underused after his fine performances in films like Iron Monkey and Project S.
Of note Russian singer Vitas has a role in the film as well as providing a song for the film score. The Cineasia Bluray release is good ,offering a good picture and DTS soundtrack for those that have compatible equipment.